Hortus Camdenensis | Crataegus monogyna Jacq. An ancient plant in cultivation. 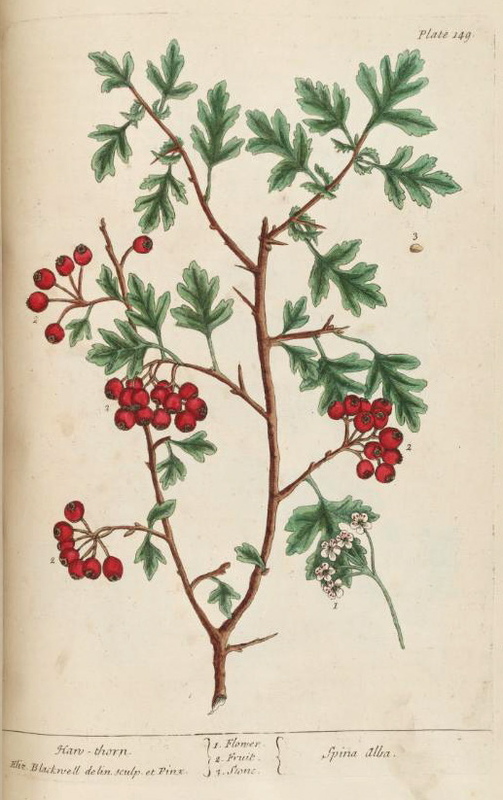 In parts of England hedges containing Hawthorn several hundreds of years old are recorded. ‘Haw-Thorn. Spina Alba. This grows to be a pretty large tree, the leaves are a deep grass green, the flowers white with reddish apices in the middle, and the berries red. It flowers in May, and the fruit is ripe in September. The flowers & fruit are both used in the shops, and are accounted diuretic, good for ye stone and gravel, & pleurisy. The Aqua Nephritica is made of the flowers.’ [Blackwell pl.149/1737]. Introduced to the gardens before 1843 under the name Crataegus oxyacantha – Hawthorn. Listed in all published catalogues [T.352/1843]. Much used for hedging and this is probably why it was introduced. Particularly suited to layering. Naturalised in parts of New South Wales. It still grows in the gardens. Crataegus oxyacantha of Linnaeus is now usually split into two species, Crataegus monogyna Jacq., or Common Hawthorn as described here, and Crataegus laevigata (Poir.) DC., sometimes called the Midlands Hawthorn. The differences between the two plants are minor, ranges overlap and hybrids are common. It is difficult to consider them as more than geographic forms. Macarthur’s plant may be Crataegus laevigata. More details about Crataegus monogyna Jacq. Crataegus oxyacantha L. emend Jacq.